It’s nice to note that this dish is also popular in Malaysia & Singapore. 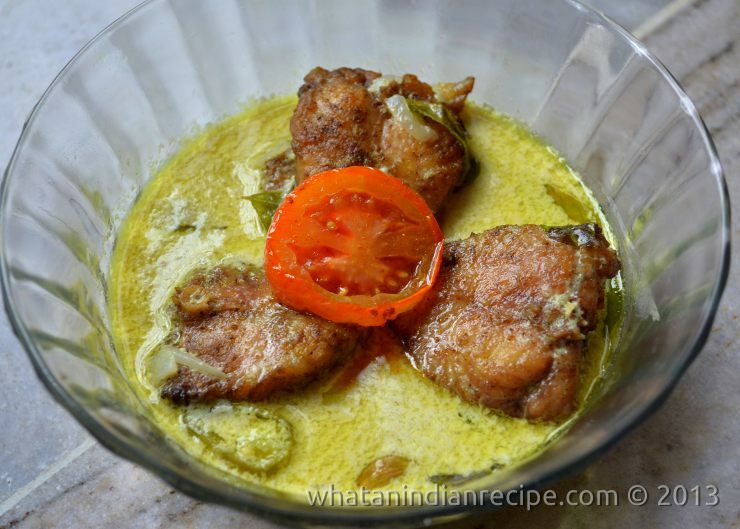 I prefer Kingfish/Surmai for this recipe, though you can try similar fish for this recipe. Make a paste of pepper powder, ginger and salt and marinate the fish with this paste for 30 minutes. Now fry the marinated fish pieces on low flame in oil till very light brown. Keep aside. Now for the gravy Heat oil in a pan saute all the gravy ingredients except Coconut milk. To this add the 2nd milk which is thinner than the 1st milk. and allow the gravy to become thick. To this add the fried fish pieces along with the thick 1st milk. Allow the gravy to heat well but do not let it boil..Rotate the pan once (chuttichu edikuga) and remove from fire. Garnish with slightly fried tomato rings and coriander leaves. You may also garnish with chopped mint leaves, cashews and kismis/raisins as per desire.